The Soyuz rocket carrying Expedition 35 crew members to the International Space Station launched from Baikonur Cosmodrome in Kazakhstan, March 28, 2013 (EDT). A Soyuz rocket carrying an American astronaut and two Russian cosmonauts roared into space today on the first-ever "express" flight to the International Space Station. 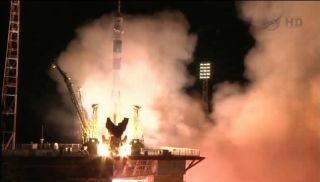 The rocket launched NASA astronaut Chris Cassidy and Russian cosmonauts Alexander Misurkin and Pavel Vinogradov into orbit at 4:43 p.m. EDT (2043 GMT) from the Baikonur Cosmodrome in Kazakhstan, where the local time was early Friday. The crew's Soyuz TMA-08M spacecraft is expected to make history when it arrives at the space station later tonight. "Vehicle is nominal. We feel great," Vinogradov radioed Russia's Mission Control just after liftoff. He is commanding the Soyuz flight to the station. Vinogradov picked the callsign "Carat" for the ship and a small stuffed toy bear as the crew's mascot. The bear, which Vinogradoz also took into space during his 2006 spaceflight, was used to mark when the crew reached the weightlessness of space. The Soyuz crew plans to dock at the space station's Poisk module tonight at 10:32 pm EDT (0232 GMT Friday). You can watch the space docking live on SPACE.com here. Until today, Soyuz and NASA shuttle trips to the space station typically took at least two days, but Cassidy, Misurkin and Vinogradov are due to arrive in just six hours, after making only four orbits of Earth. Some NASA officials have dubbed the flight profile, the "express" flight to the International Space Station. "I think this is a very good thing that we are decreasing the time that it takes for crews to reach the International Space Station," Vinogradov said in a pre-launch interview. "I'm confident that both in Russia and in the United States we have excellent teams that are supporting us." The quick trip to the space station has been made before by unmanned cargo spacecraft, but never by a crew. Mission managers say its benefits include less time spent in a cramped space by the crew, and a savings on expenses related to the personnel needed in Mission Control when Soyuz is flying. Once there, they will join the existing station residents — commander Chris Hadfield of Canada, Russian cosmonaut Roman Romanenko, and NASA astronaut Tom Marshburn — on the station's Expedition 35 mission. The newcomers are due to stay in space for about six months. "It's shaping up to be a very dynamic and a very busy expedition," Cassidy said during a pre-launch interview. "We welcome that — that makes us feel very rewarded and high job satisfaction. When you can deliver for people that have worked hard to produce all of those activities on the ground, that's very satisfying," he said of the ability to fulfill the goals of the Mission Control team. The space station sailed high over the launch site just before the Soyuz blasted off, giving the current residents of the outpost a chance to see the launch via a live feed. "Just watched the Soyuz launch! The rocket's red glare, powering up away from the Earth, turning towards us in hot pursuit. Incredible to see," wrote Hadfield on Twitter (@Cmdr_Hadfield). Cassidy and Vinogradov are both spaceflight veterans: The former flew on the STS-127 space shuttle mission in 2009, while Vinogradov visited the Russian Mir space station in 1997 and the International Space Station in 2006. Misurkin, a spaceflight rookie, is making his first journey to orbit. "I'm just really excited and looking forward to this flight," he said in a preflight interview. "I think it would be a great experience for me and the biggest thing in my whole life." In between their busy schedules of science experiments, space station maintenance and spacewalks for station upkeep, the spaceflyers hope to find some down time to appreciate their environment. Vinogradov is an astronomy buff and said he looks forward to the view of the heavens from space. "I think I'm very fortunate that I have this unique opportunity to perform space observations from space," Vinogradov told SPACE.com in a preflight interview. "Every time I get a spare minute I plan to practice astronomy. I cant promise or guarantee that this will happen every day, because our flight program is very busy, but I am planning to use every opportunity to do that." Vinogradov is scheduled to take over command of the space station from Hadfield in May when Hadfield, Romanenko and Marshburn return to Earth. Vinogradov, Cassidy and Misurkin are due to return home in September.